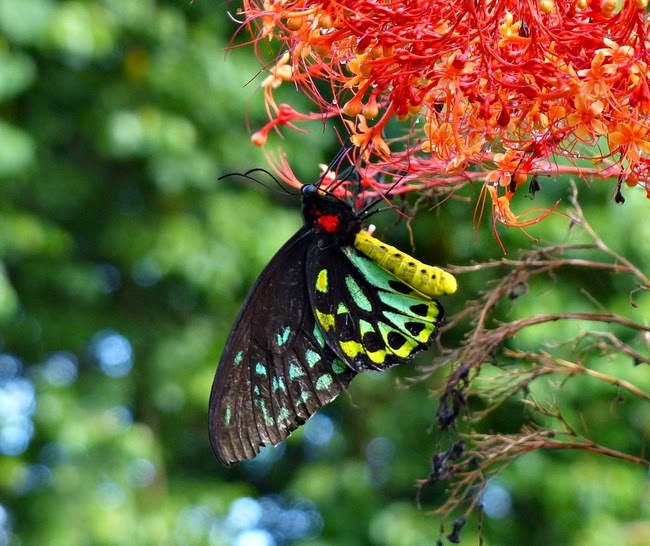 Daintree Valley Haven: Butterflies galore - still! Wow, have we got some butterflies now after the rain has gone and beautiful sun is drying everything out! For the past few days the lovely blue Ulysses have been everywhere and now the first of the Cairns Birdwings are appearing. This is a male a few minutes ago on one of the Pagoda flowers outside the kitchen - his back is a stunning irridescent green and the female is darker on the back. She is also Australia's largest butterfly, with a wingspan of up to 150 mm (6 inches).